They're not just hot, but also quite tasty. Not the hottest in the world, but they do have some nice kick that sort of grows on you after your first bite. 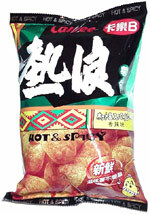 Like most Calbee products, they're a quality, crisp, crunchy chip. Smell test: Sort of a paprika smell.